Yesterday I shared with you how we updated our Ikea Kallax by adding legs, and the mirror that sits on it reflects one of my favorite and most colorful areas in our home, the kids art wall! I have actually had this in place for quite some time… like oh maybe a few years… but I didn’t have the right lens to shoot in such a tight space like our hallway. So I just never shared it. But last week Ashley asked me about it on instagram as she noticed it in the mirror. 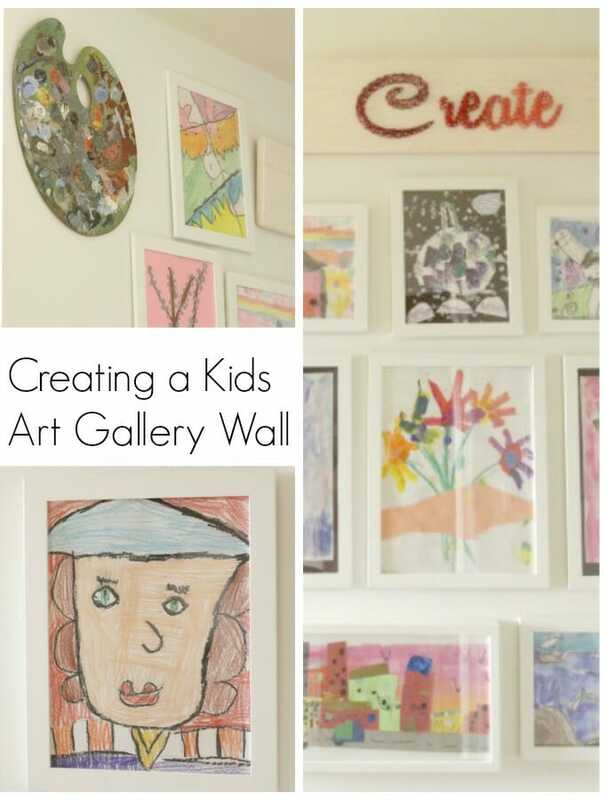 I thought it was about time I shared with you how I went about creating a kids art gallery wall in our hallway. I have always loved it when Sawyer and Emmy brought new artwork home from school. Seeing the world through the eyes of a child is an amazing thing. They see vibrant colors, happiness, and life all around them. 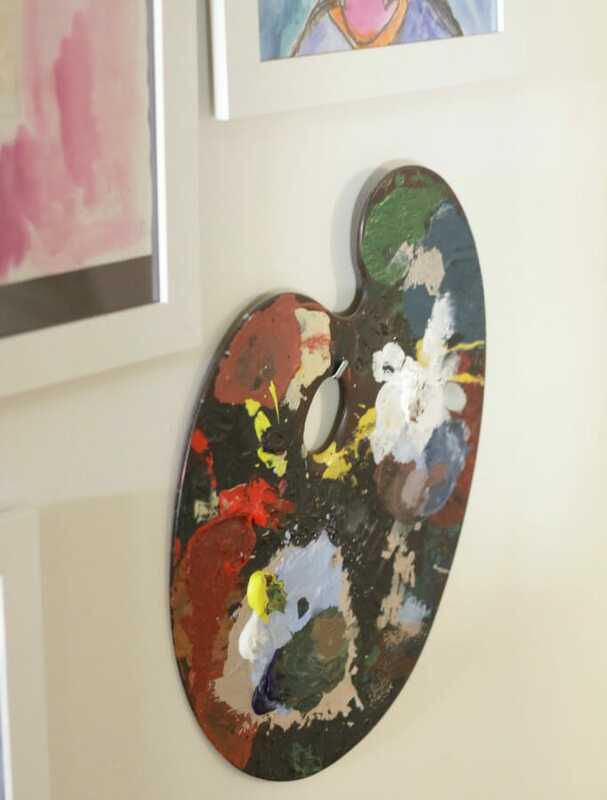 Hanging it in our house helps keep that joyful spirit alive. 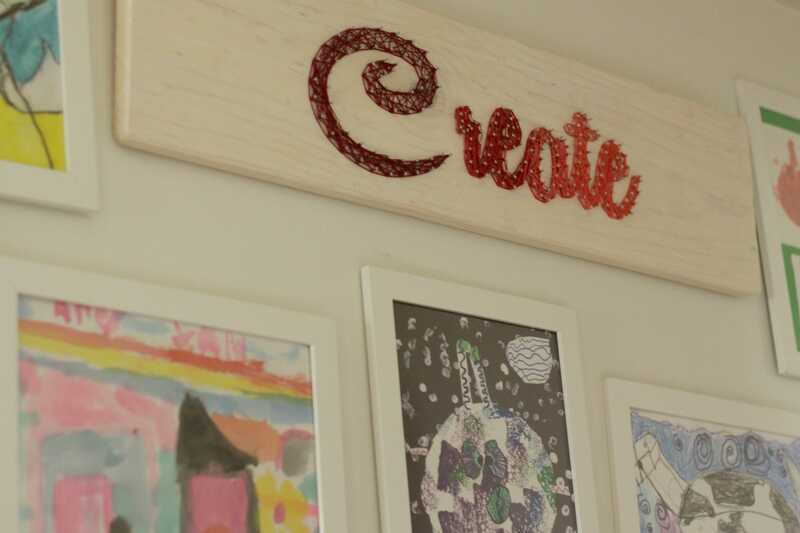 Because I want to nurture creativity in my kids, I also believe in displaying their artwork to show them how much I love and appreciate it and to give them a sense of pride, accomplishment, and confidence. So while their happy images make me happy to see, they make the kids happy as well. After collecting several pieces over the years and storing them, I pulled out some of my favorites, measured them, and hit Ikea for a collection of inexpensive white frames. When I purchased the frames, I bought extra so that I could add to the wall as life went on, and more artwork was brought home. 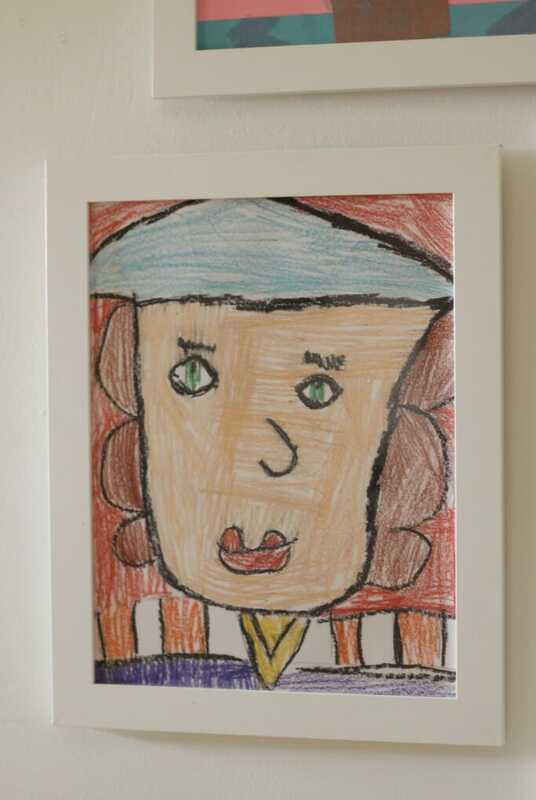 George Washington, by Emmy, was a later addition to the wall. To tie it all together, I happened to win a piece of custom amazing string art from my friend Jesse. I asked him to spell “Create” and told him he could be as colorful as he wanted. Once I received that I hung it right at the top. And then just this past November I shopped at The Vintage Market at the Old Red Barn and scooped up two vintage artist palettes complete with colorful oil paint. They were the perfect addition to the wall. And look at all that space below the bottom row…. I’ve got room to keep on adding to this wall! 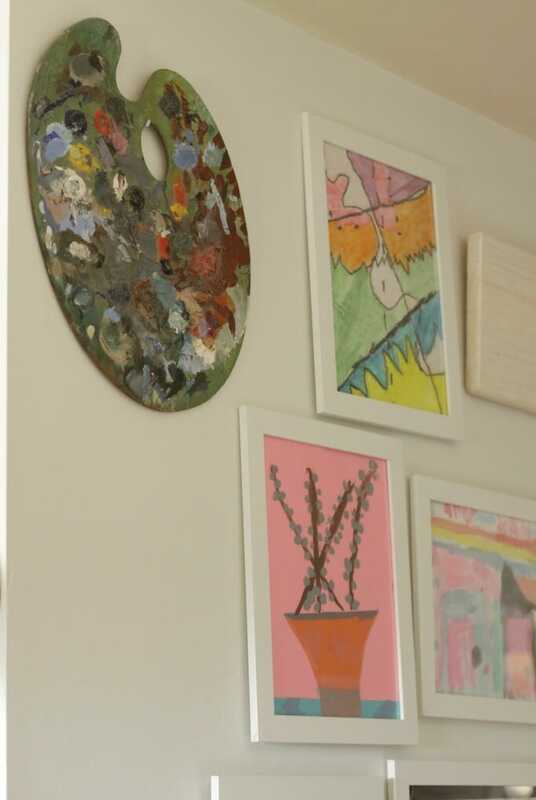 As much as I love having artwork around my house, such as the seascape wall in the dining room, there is truly no piece that can ever move me as much as the art my kids create moves me. oh i would love to see! i do love the shade we chose but i think i am over the pink, but the kids love it! So cute!! We have one and I adore walking by and seeing it! Oh, I love it so! Honestly, I was inspired immediately and now have four of Greyson’s pieces of art in frames waiting to be hung. Still trying to decide on where to hang but they’ll go up soon. What beautiful art!!! I have got to put one together for the kids! yes- do it! it is such a happy space! I love kid art…It is the most beautiful art ever! Thanks for showcasing your kids art. it really is- totally unreserved and creative! What a great idea, Cassie. I’ve been hoarding some of my favorite from my girls to do just this thing eventually. I just haven’t gotten around to it yet! thank you so much, jennifer! you really should- it makes me happy! Love this colorful wall, Cassie! Sawyer & Emmy are quite the artists! 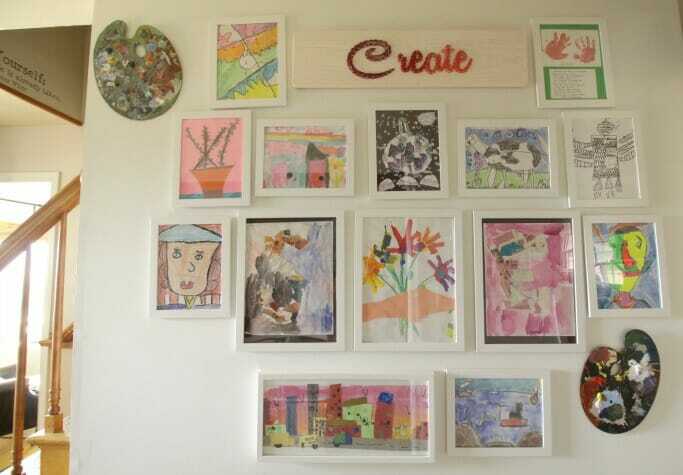 I had a kids’ art gallery in my last house and it was FUN and happy. The addition of those paint palettes is so great, and the string art! thank you so much, lisa! it really is a happy space! I actually started doing this about 3 months ago with black frames, but they are just sitting on my bedroom floor…waiting for more frames (I have plenty of artwork from my three guys). Will post when I get them up, but don’t hold your breath — I finally posted my kitchen reveal after only six months. Love it! I can’t wait until Abe starts making stuff like this (umm….maybe I should send him to preschool next year, to hurry things along without having to clean up paint myself ;)). I love this! We have a couple of pieces around our house that my daughter has painted and it is so fun to see her face light up when she sees her art hanging prominently in our home… plus some of her pieces are kind of amazing for a 2.5 year old. 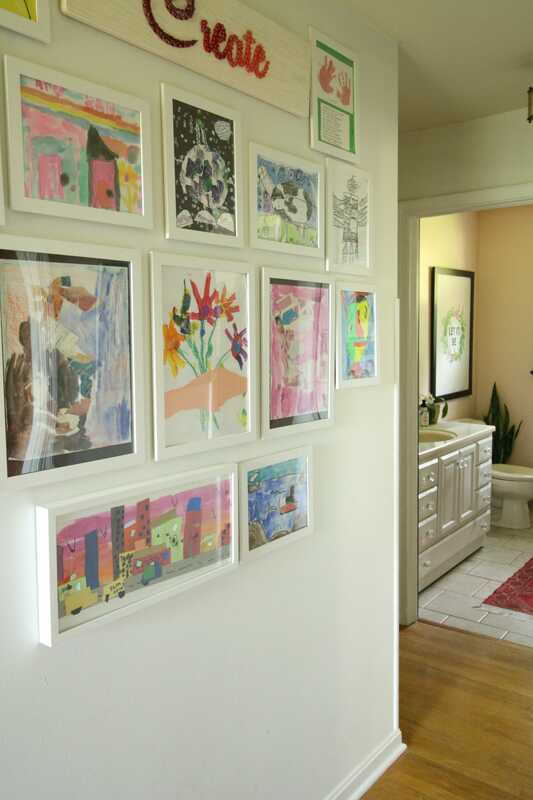 I love how the art works with your pink bathroom. yes, that’s what it is about- making your kids feel special! This is so awesome! I love the mix of artwork and the painting palettes and the string art! It’s perfect!